Scottsdale is a city in the eastern part of Maricopa County, Arizona, adjacent to the Greater Phoenix Area. 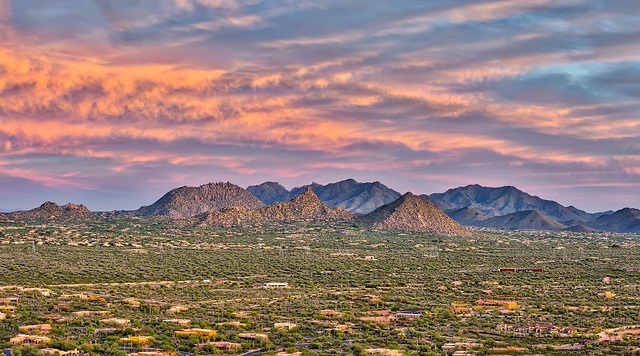 The city is loosely divided into four areas: South Scottsdale (McKellips Road north to Thomas Rd), Old Town (Downtown) Scottsdale, Central Scottsdale (also known as the "Shea Corridor," which extends from Camelback Rd north to Shea Blvd. ), and North Scottsdale. South Scottsdale is the home to a new research center for Arizona State University, known as SkySong, a collaboration between the university, local business and global companies. The development has attracted the research and development arms of a number of international corporations. Old Town Scottsdale is an area of many old fashion stores, restaurants, bars, nightclubs and art galleries. It contains the major nightlife for the area and is a major art center of metro Phoenix. Scottsdale's main cultural district is also in this area, which includes the high-end Scottsdale Fashion Square Mall, one of the twenty largest malls in the United States. Old Town has recently seen a revival with new condominiums and hotels under construction. The Shea Corridor is so named due to its close proximity to the east-west running Shea Boulevard. There are a number of communities in this region of Scottsdale that are among the most highly desired residential areas in the metropolitan area, including Gainey Ranch and McCormick Ranch. North Scottsdale claims many of the most expensive homes in Arizona, with many exceeding $5 million in value. The city's borders are expanding to the east and west in this area, containing the McDowell Mountain range. Scroll down for more information on the Scottsdale market and to search Scottsdsale properties. And be sure to call Linda Martin at 480-225-8884 if you are interested in seeing any properties for sale in this area!